Today’s walk was only slightly longer than our last one but had a greater amount of ascent so there was a bit more heavy lifting to do to begin with. 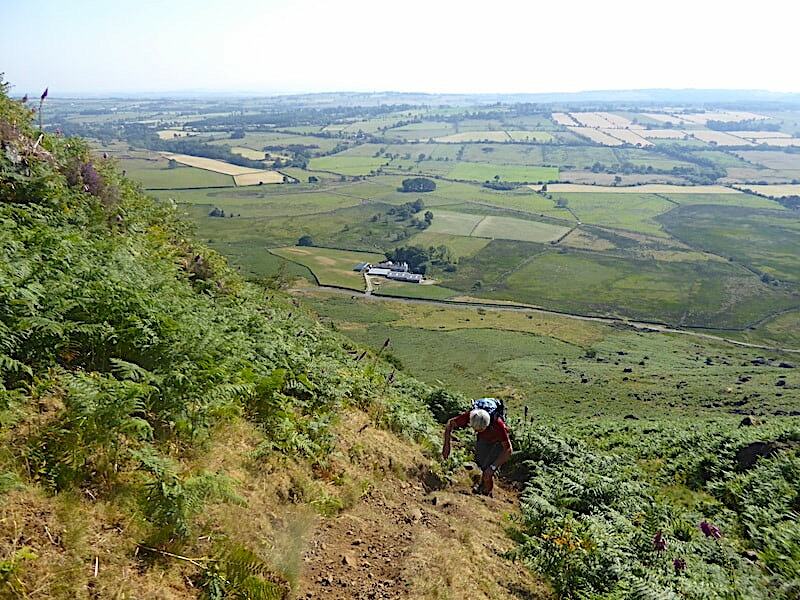 High temperatures were again forecast so it was up early and over to Stone Ends Farm along the Caldew Valley to get the steep climbing over and done with before the heat started to build. That’s not to say it was cool and comfortable because it wasn’t but getting a steep climb out of the way early on is preferable to slugging it out from mid-morning onwards. 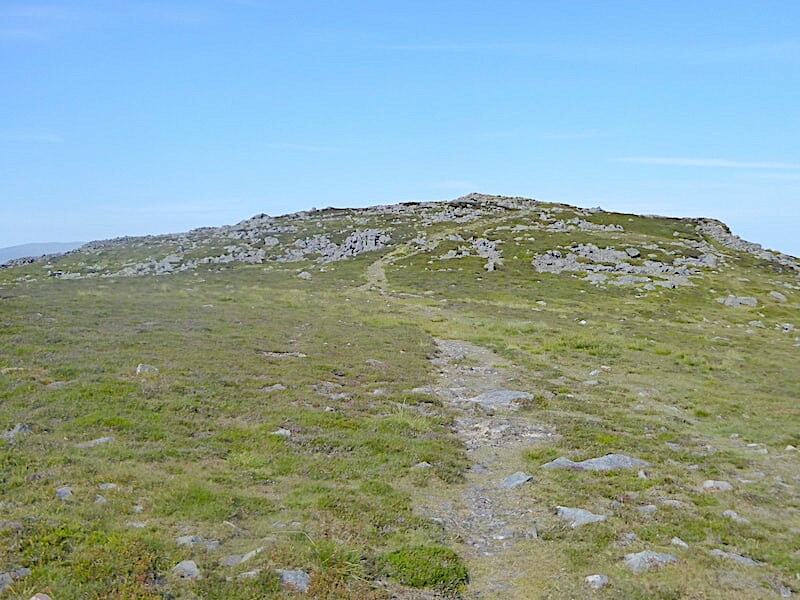 Once on the summit of Carrock Fell we had the benefit of a cooling north westerly breeze which made the walk, across bone dry ground, to High Pike well worth the initial sweating and swearing climb up Rake Trod. 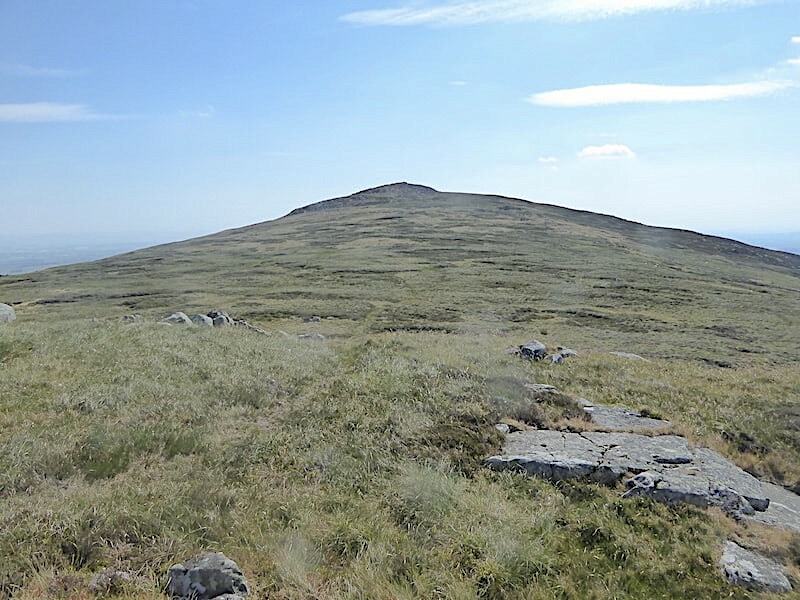 We met no-one until we reached High Pike where a couple had just arrived from the West Fell route and the only other walkers we met were a trio of elderly gents steadily sweating their way up West Fell as we descended. 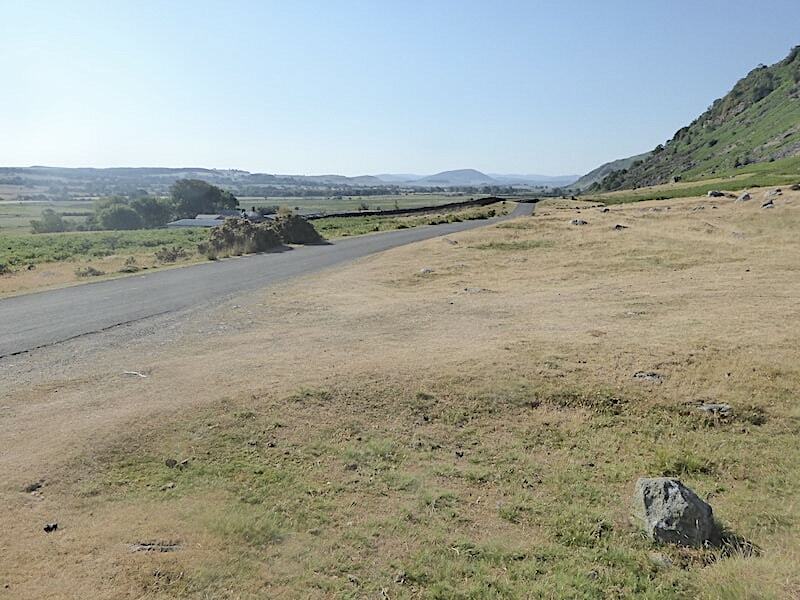 Carrock Fell from the parking area near to Stone Ends Farm. 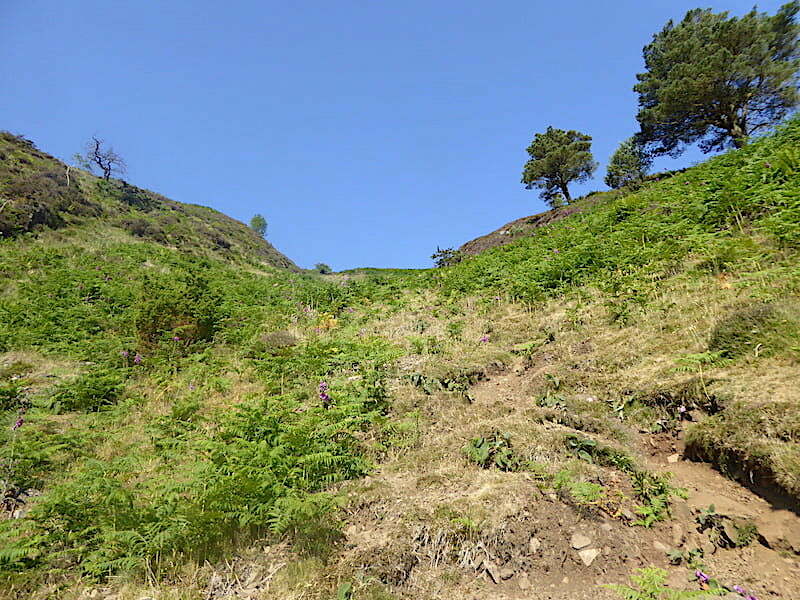 The line of ascent, known as Rake Trod, rises leftwards through the bracken below the crags towards the trees on the left. 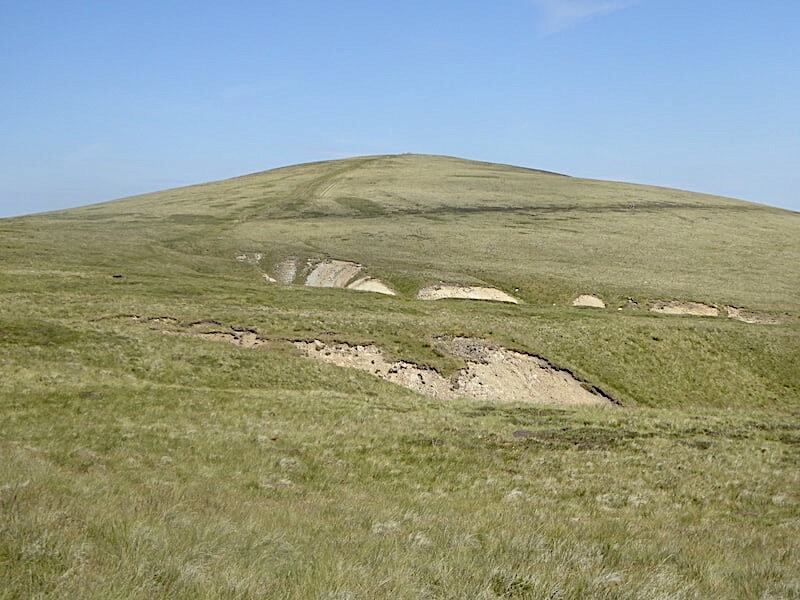 The depressions across the foreground are some of the remains of the former Carrock End Mine, a small scale copper mine which finally closed in 1869. 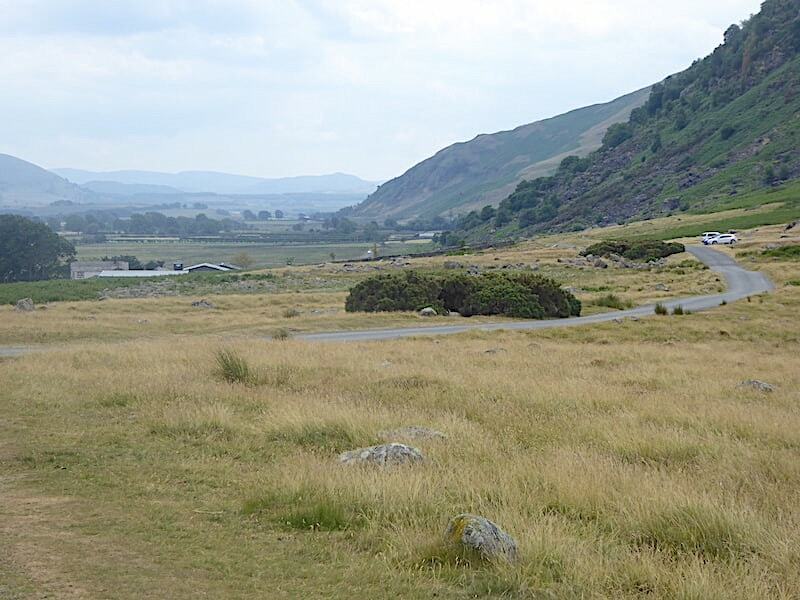 Looking along the road towards Stone Ends Farm on the Caldbeck road with Great Mell Fell in the distance. Not a cloud to be seen and its already very warm. 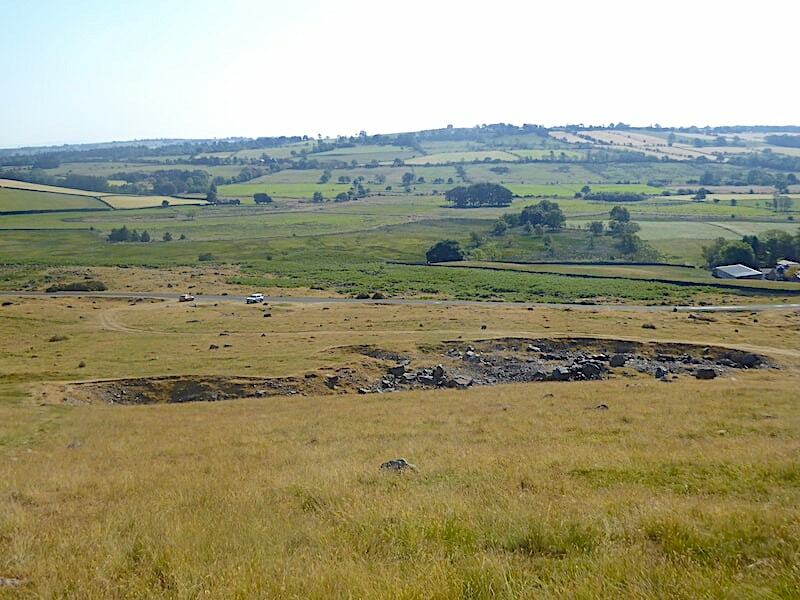 We cross the parched grass and pick up the Rake Trod path from where I took a look back at the parking area beyond the Carrock End Mine diggings. 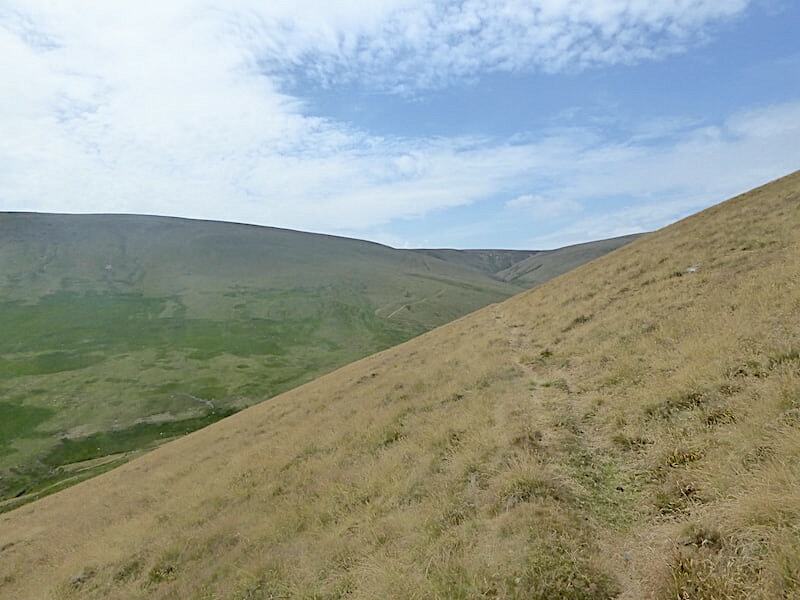 Rake Trod is a steep but steady pull up and at the end of it the path levels off briefly before it turns into this very steep gully of Further Gill Sike, very much the steepest part of the ascent and where the path deteriorated quite badly. 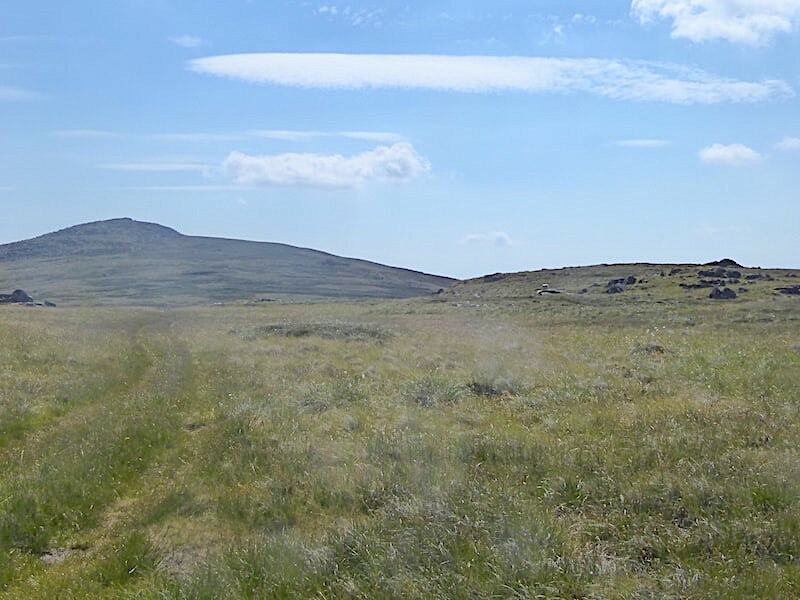 The prolonged dry spell has reduced much of it to loose dust, strewn with small stones, making it very difficult to get a good purchase beneath our boots so we were slip-sliding constantly. Stepping to one side of the path didn’t help much either since the ground was so dry it often crumbled away when we stepped on it. 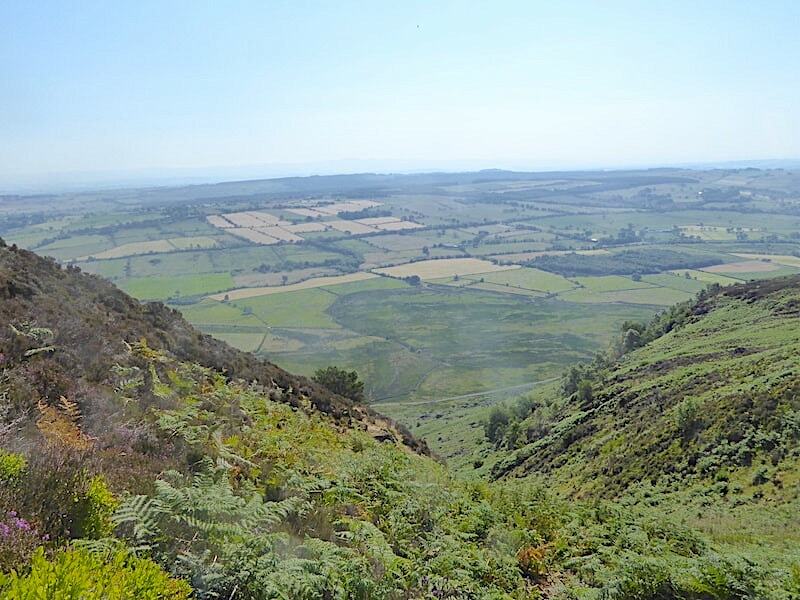 Hands were needed in many places and we could only be thankful that the bracken was nowhere near as high as it was when we climbed up Brock Barrow a couple of days ago. J sweats, curses and grapples his way up the gully. The sides of the gully have blocked out the breeze leaving us to clamber through a hot dry furnace. Sweat pouring down our faces, necks and backs so we pause for a quick mop round and drinks. The stones littering the route give some idea of the difficulty of gaining a firm foothold on such steep slopes so we took to walking the edges wherever possible. I began to wish I’d still got my snow spikes with me. At this point we’re only halfway up the stairs so to speak, a bit like Kermit. We grapple our way through the gully and after what seemed like forever we finally reached the top of it. 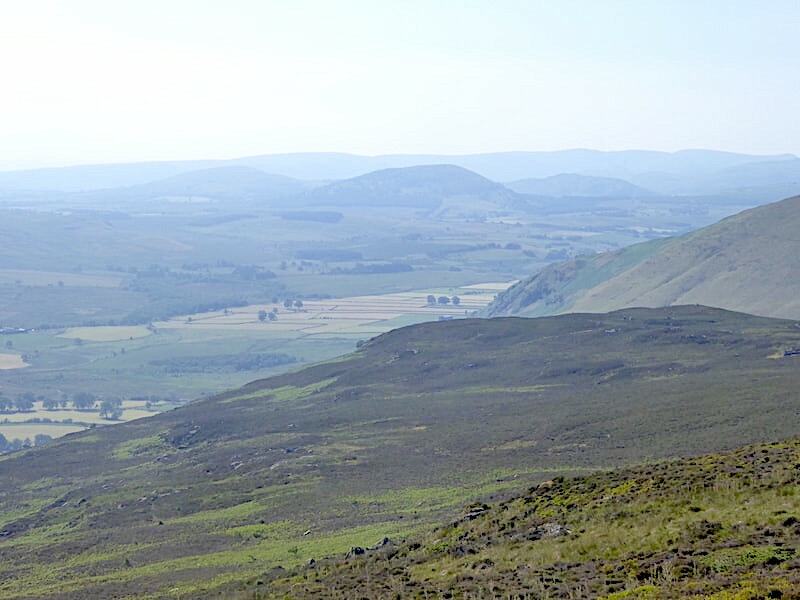 Long distance views were obscured by the haze today but the North Pennines could just be seen in the distance. With a firm path under our feet once again we take a short break, take some more liquid on board, dust ourselves off and generally get back to something resembling normality again. 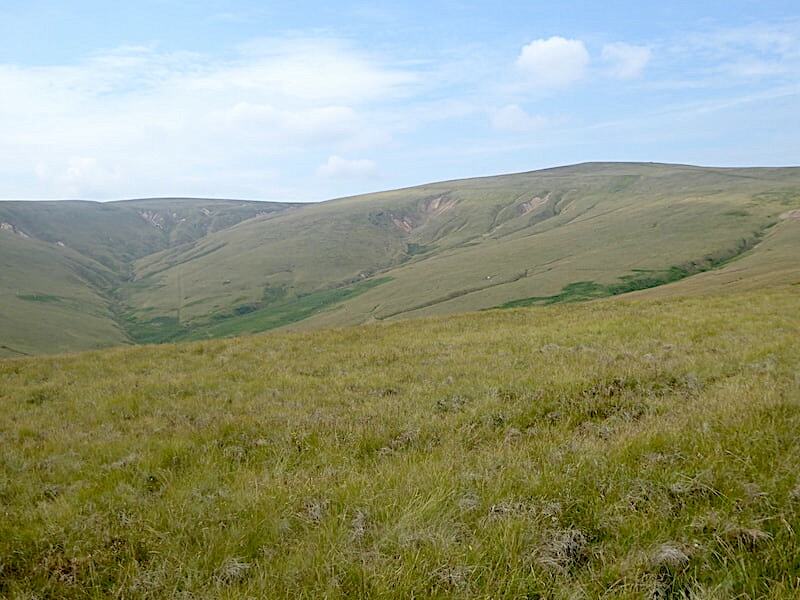 Looking across the heathery lower plateau of Carrock Fell towards Bowscale Fell as we continue upwards from the gully. 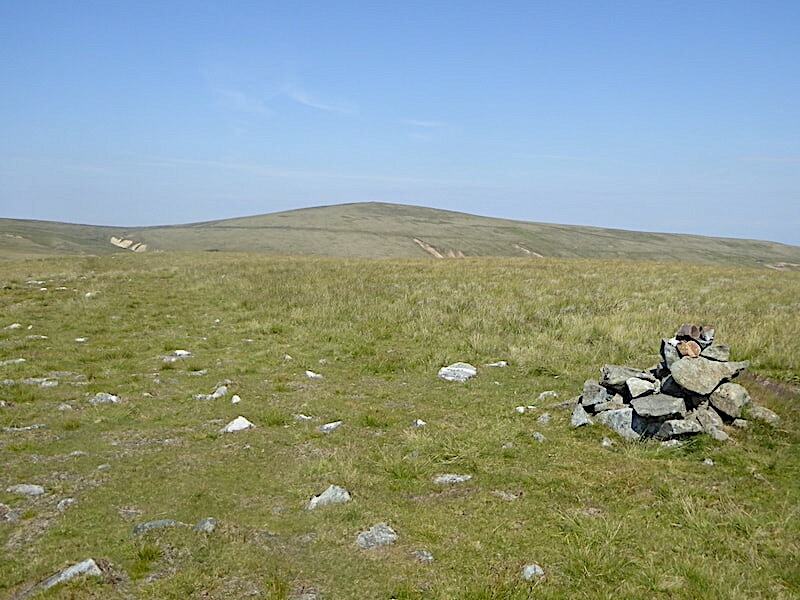 Thankfully the gradient becomes much easier from now on and, with the benefit of the breeze once again, the conditions are much more amenable. I usually grumble about the wind but not today, emerging from the fiery gully into the brisk fresh air almost felt as good as stepping into a cold shower. 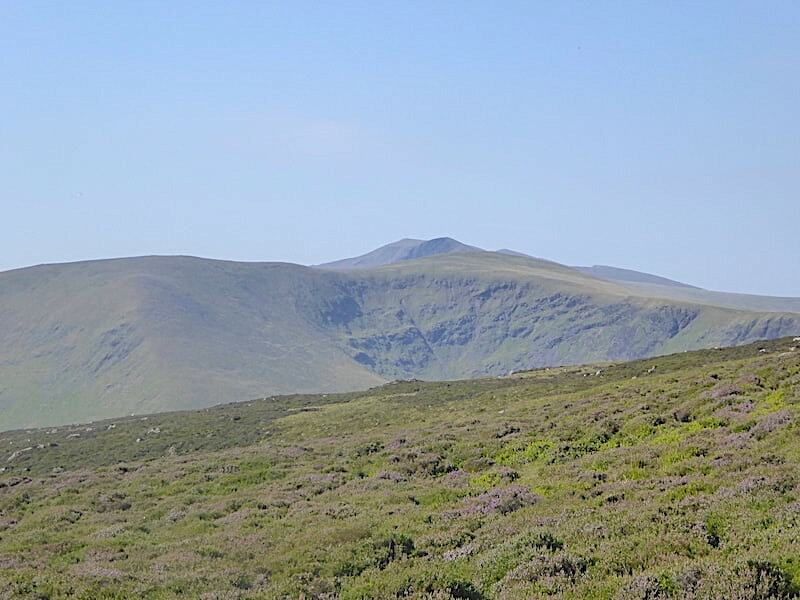 Beyond the lower slopes of Carrock Fell and Bowscale Fell are the two Mell Fells with the upper slopes of Gowbarrow Fell just to the right of them. 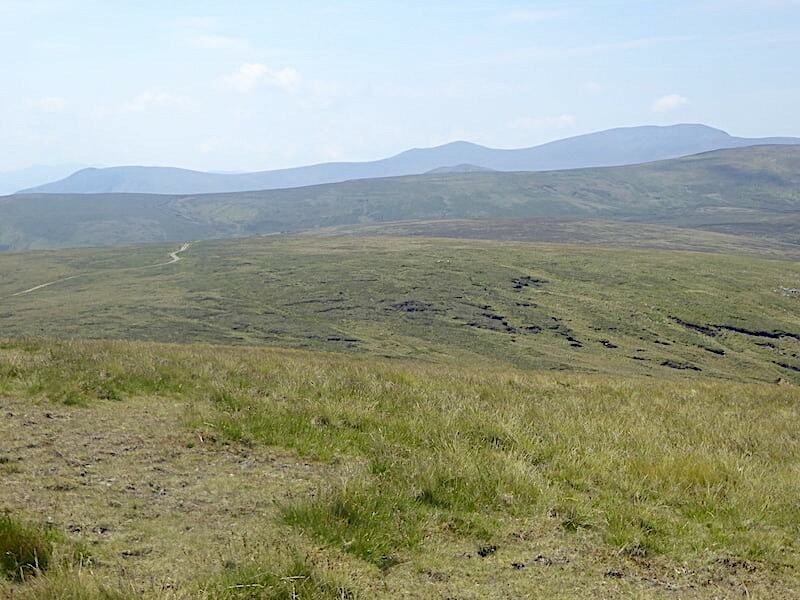 The smoky blue outline of the far eastern fells is on the distant skyline. 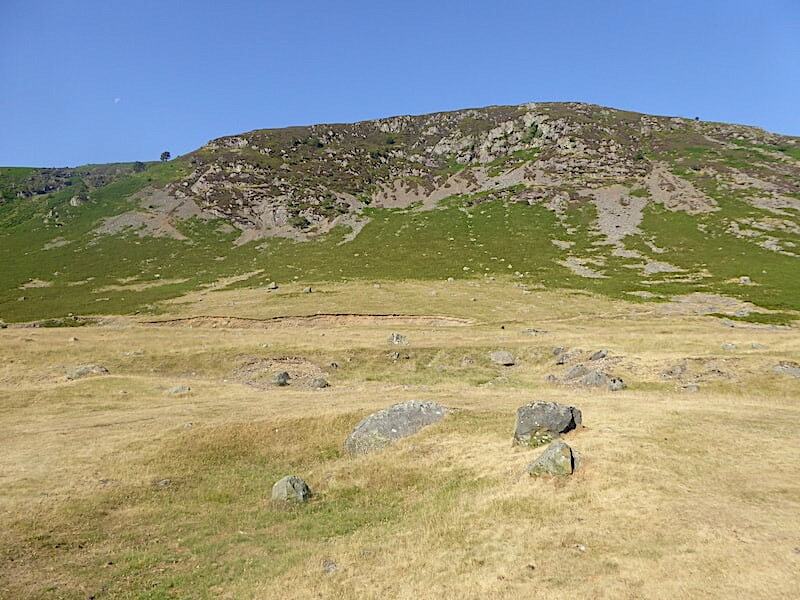 The sheepfold indicated by AW at the 1800′ contour beyond which we can see Bowscale Fell and the very tip of Blencathra. 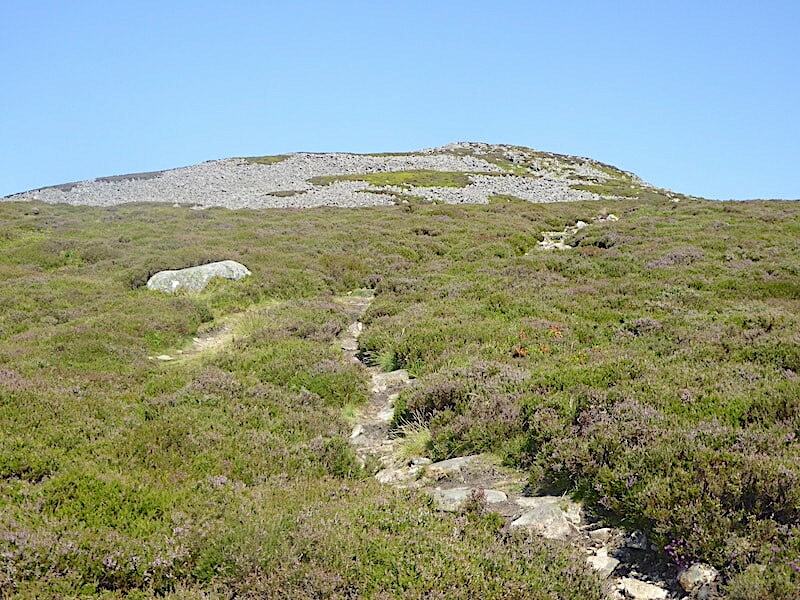 As we get closer to the east peak on the summit ridge we lose the grassy path which now meanders through the heather providing us with firm footings over large stones all the way to the top. 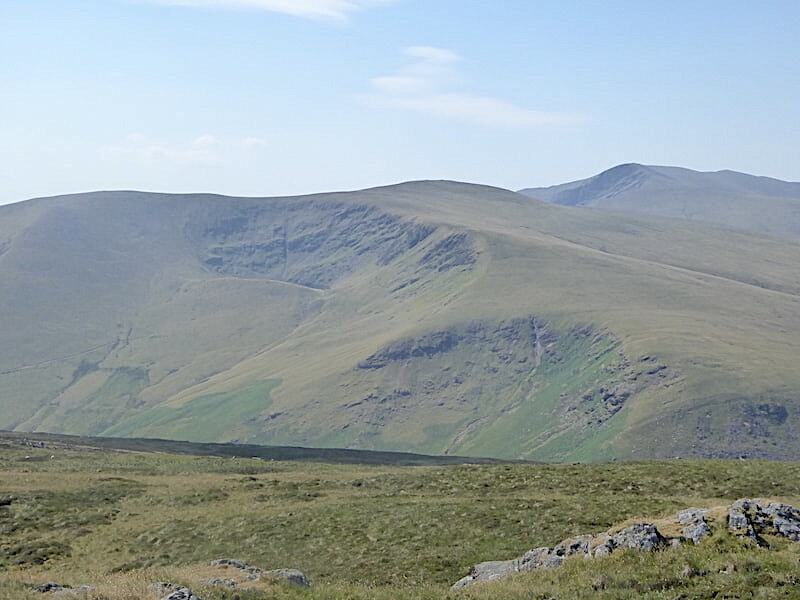 Blencathra looms a little larger over Bowscale Fell as we make our way over to the east peak. 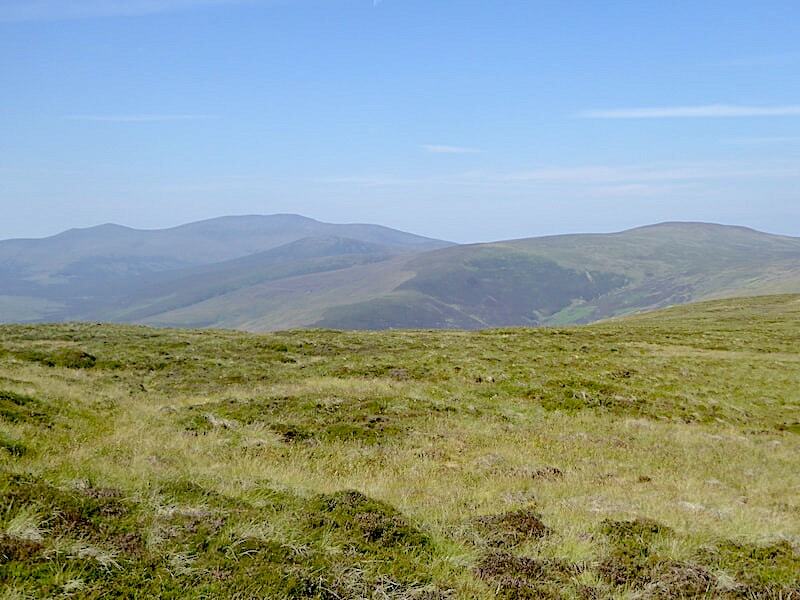 The view ahead from the east peak with Skiddaw now beginning to put in appearance beyond. 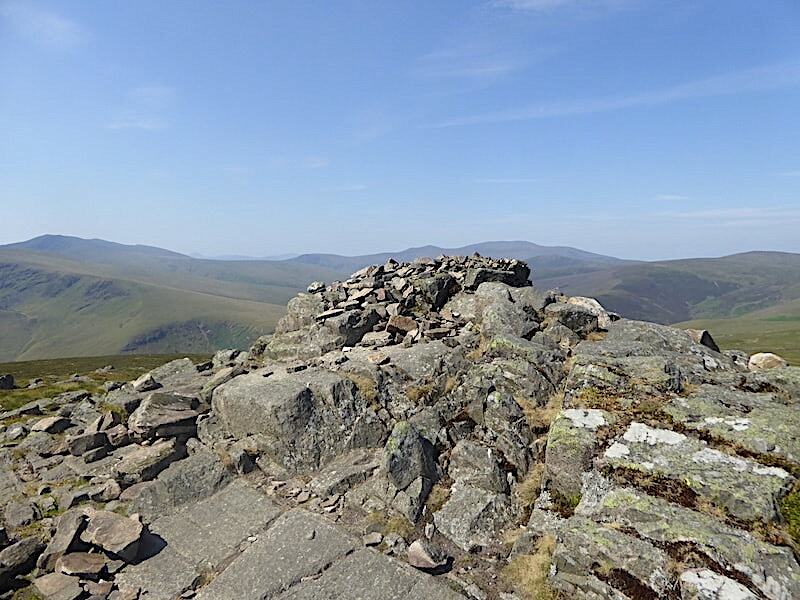 Beyond the east peak now and onwards to the summit …..
….. where the path weaves a course through the rocks and boulders up to …..
….. the rocky peak where the tall summit cairn we saw on our last visit in April 2015 looks to have collapsed. 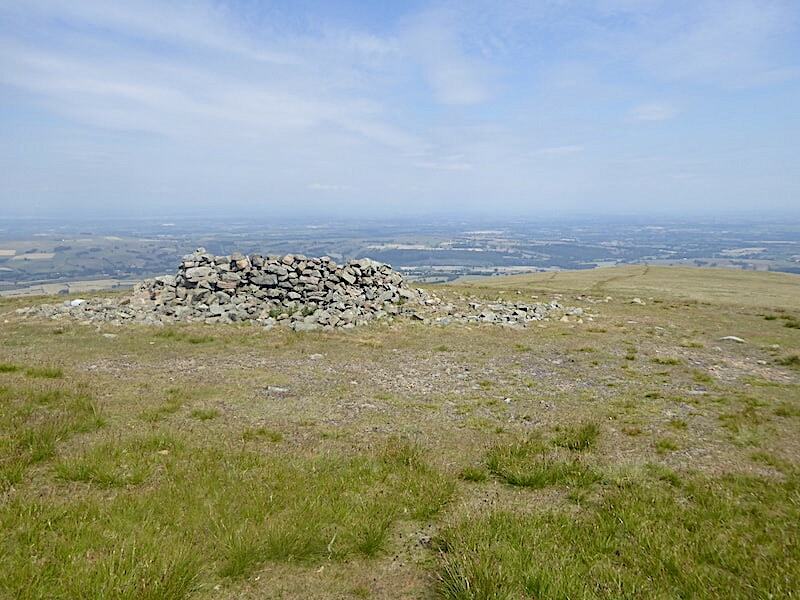 The skyline behind the collapsed cairn now gives us views of Blencathra, on the left, the Skiddaw group in the centre and Knott on the right. 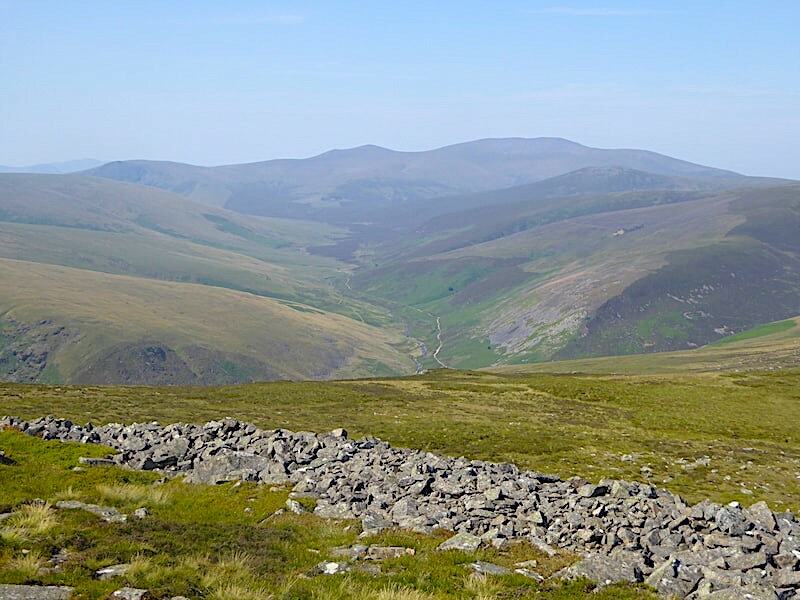 From the summit there’s a grand view of, from left to right, Lonscale Fell, Skiddaw Little Man, Skiddaw, with Great Calva just below it, and the Caldew Valley. Mungrisedale Common providing the slopes to the left of the shot. 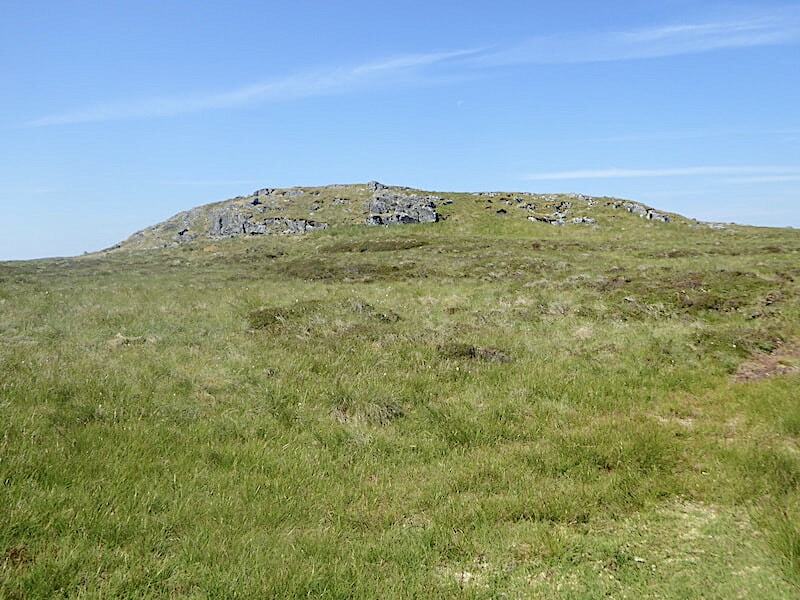 The collapsed walls ringing the summit were once part of an ancient hill fort of unknown age and origin, thought to be early British, and which certainly gave anyone occupying the fort an extremely extensive view of everything around them. 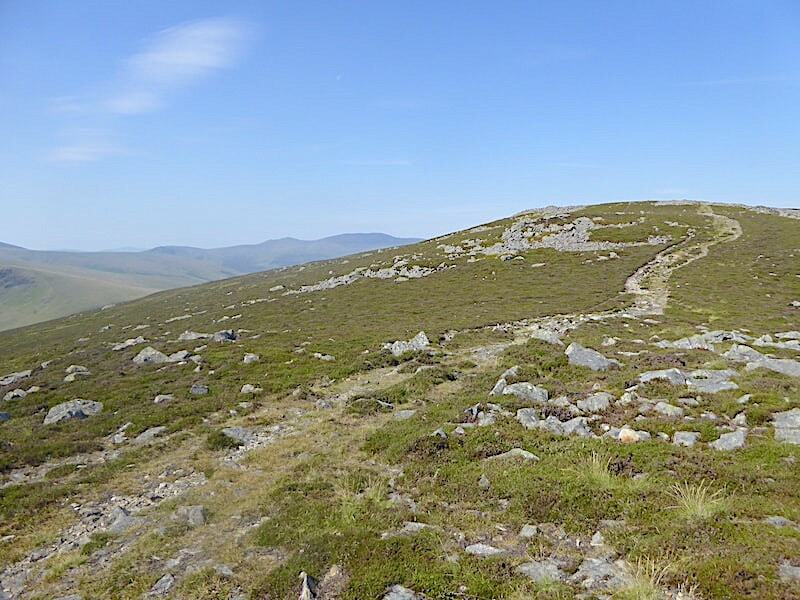 A thoroughly enjoyable two mile tramp across the dry connecting ridge awaits us. Grainsgill Beck and Knott can be seen to the left of the shot but we’re heading for High Pike over on the right. 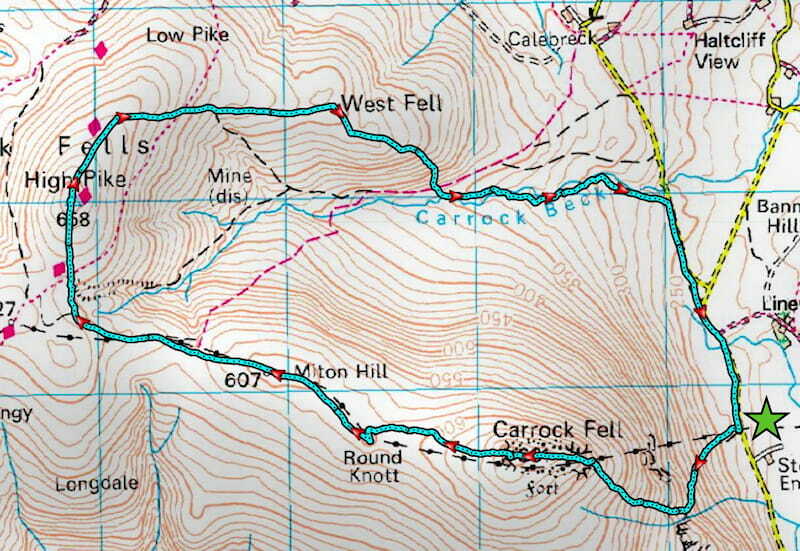 We won’t head straight for it though as we’ll making a couple of diversions along the way. 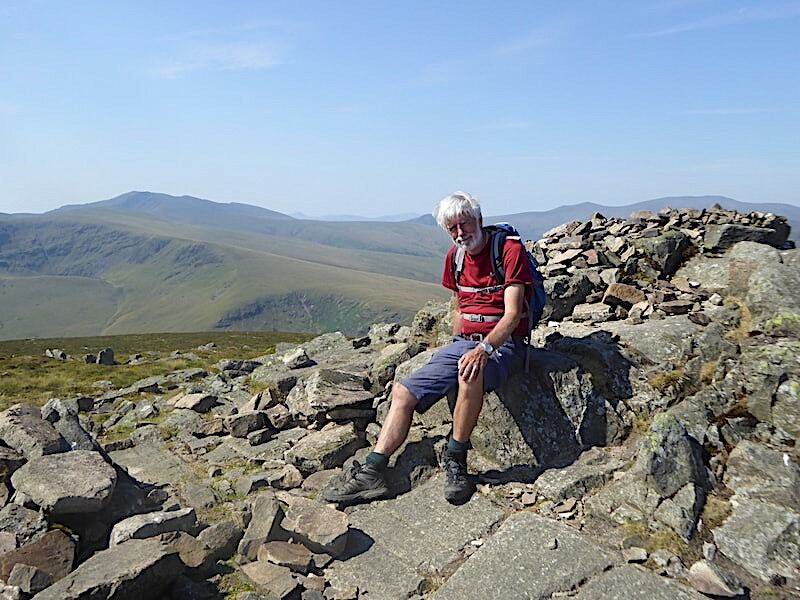 After his travails through the gully J enjoys a very welcome sit down …..
….. and so do I.
Knott on the skyline below which is its subsidiary top of Coomb Height. 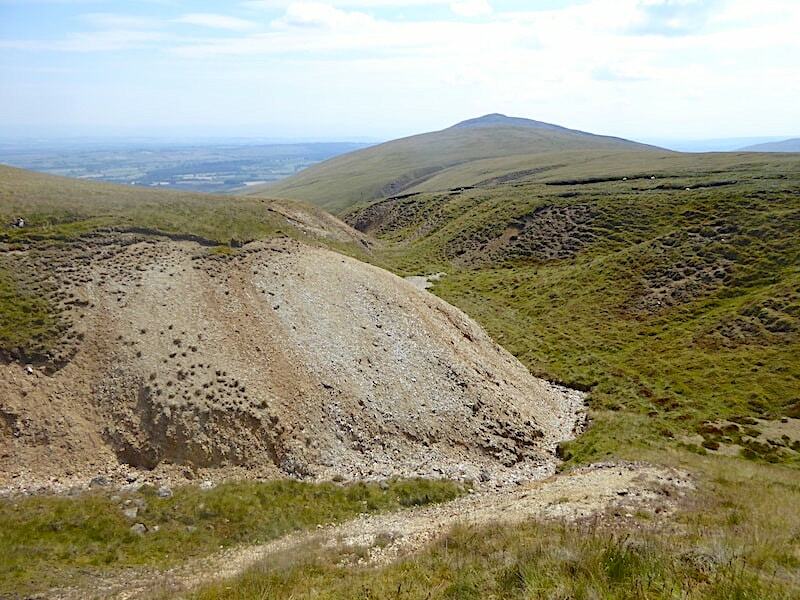 High Pike showing the evidence of old mine workings across its eastern face, Drygill Head to the left, the intriguingly named Red Covercloth in the centre, and the Driggeth Beck workings on the right. 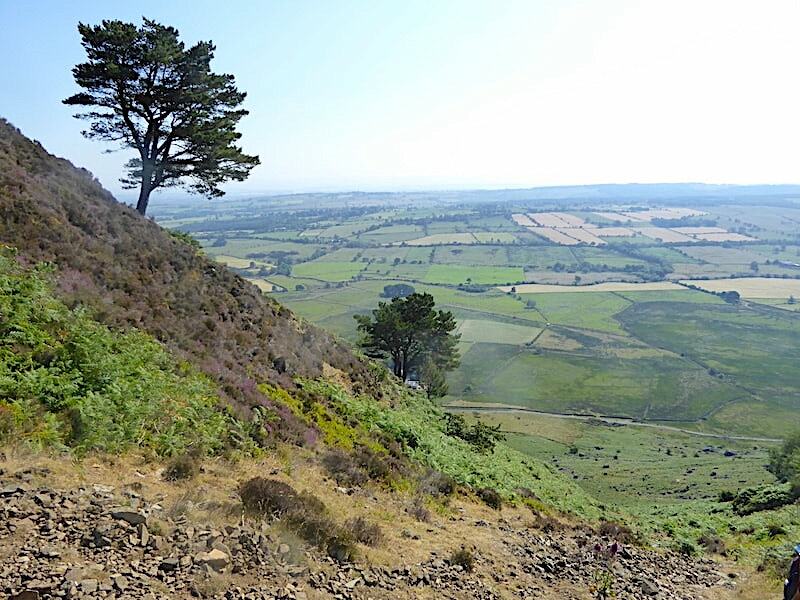 We drop down from the summit and begin the grand little tramp across the grass, heather and bilberry, spotting some early fruiting bilberries here and there along the way. They were quite small but were ripe enough to provide their lovely sweet, tangy flavour. 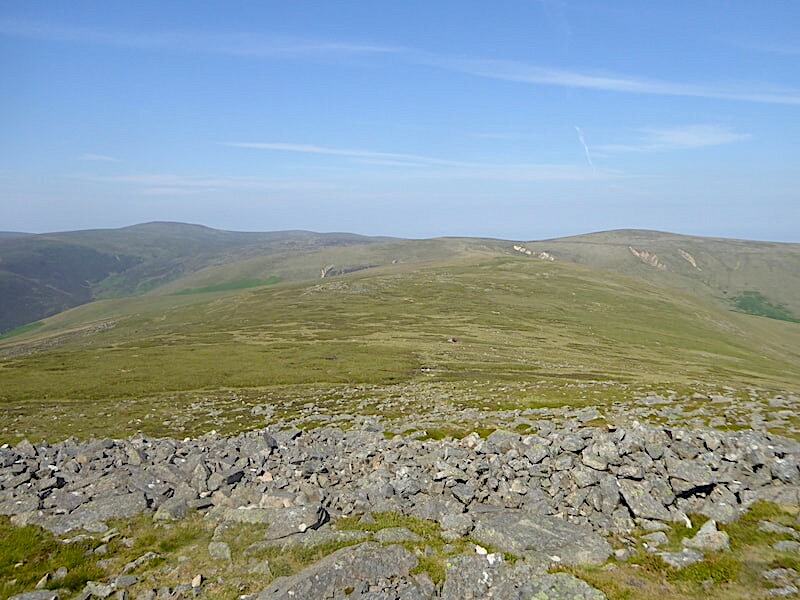 The first of our diversions is over to Round Knott …..
….. from where I took a look back at Carrock Fell summit and …..
….. then a look along the Caldew Valley with the slopes of Mungrisedale Common on the left, those of Great Calva and Knott on the right and all of it brought to a big full stop by Lonscale Fell, Skiddaw Little Man and Skiddaw. A cracking good view from such a little bump in the ground. Only the tiniest smidgeon of Bowscale Tarn can be seen in the craggy corrie below the summit of Bowscale Fell and if you zoom in and peer hard enough you might be able to pick out Sharp Edge on Blencathra behind it. 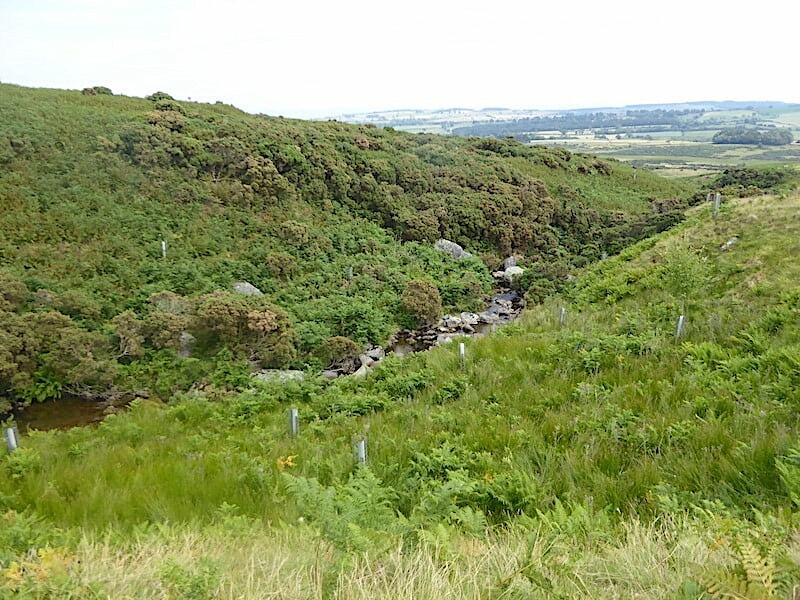 Knott and Grainsgill Beck again. 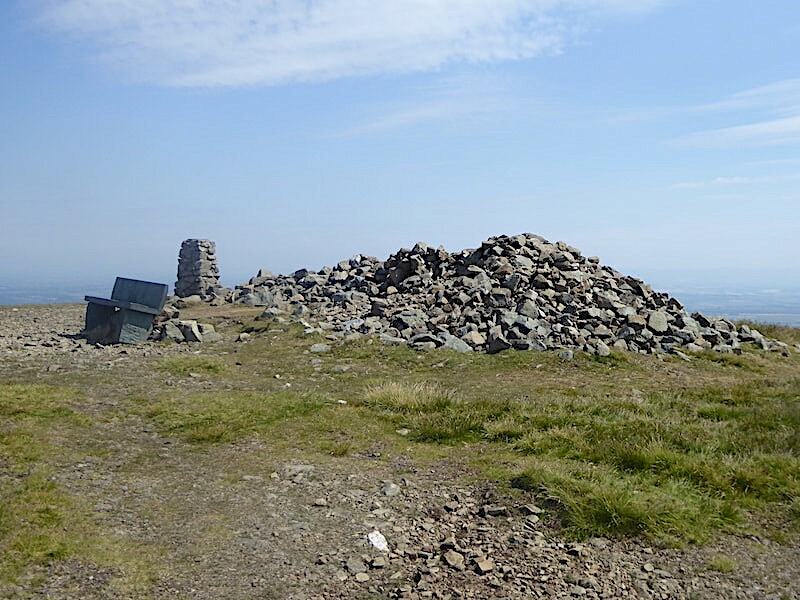 The last time we were here Round Knott had a cairn, today there were just two stones occupying the top of the rock outcrop. Hardly a cairn, very dull and uninteresting and not worth the bother of taking a shot of them, so I didn’t. 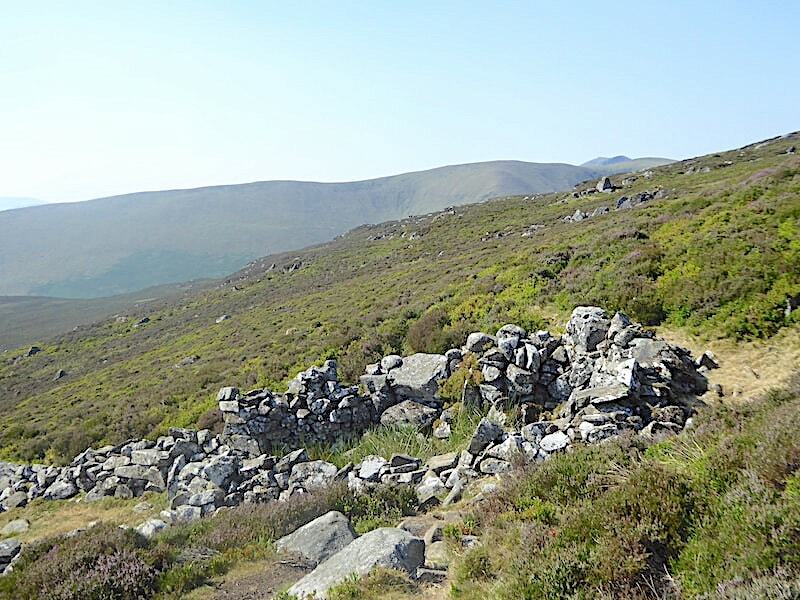 Looking back at Round Knott and Carrock Fell as we continue across the ridge heading towards …..
….. the unremarkable mound known as Miton Hill which does at least have a cairn worthy of the name, albeit a very small one. 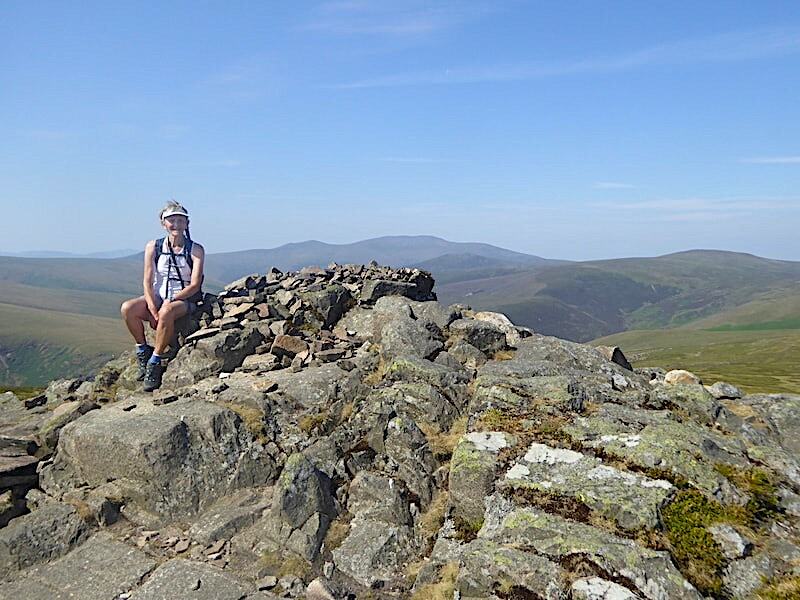 Even so its better than the two dreary stones atop Round Knott. 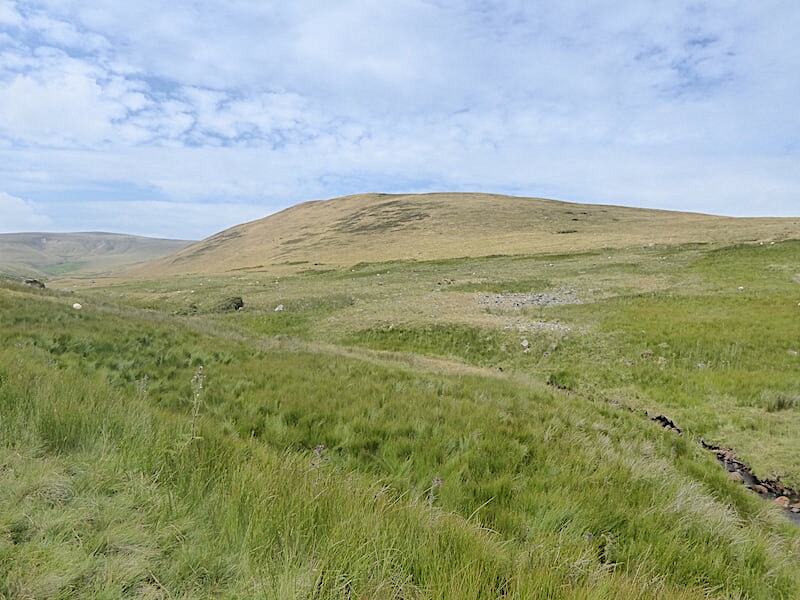 A vast open space to enjoy as we carry on towards High Pike, no fell runners, no walkers, no mountain bikers, no off-roaders, no sheep, nowt. 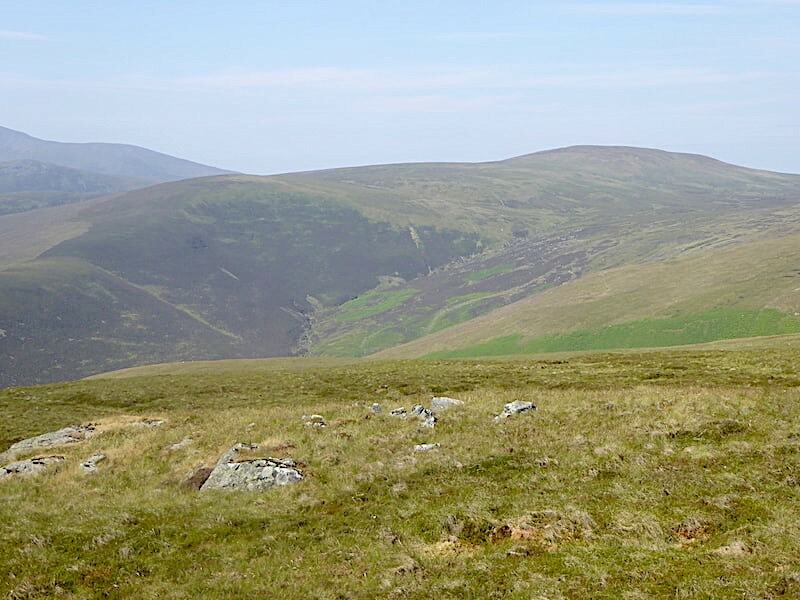 If you like solitude and peace and quiet this is the place for you. 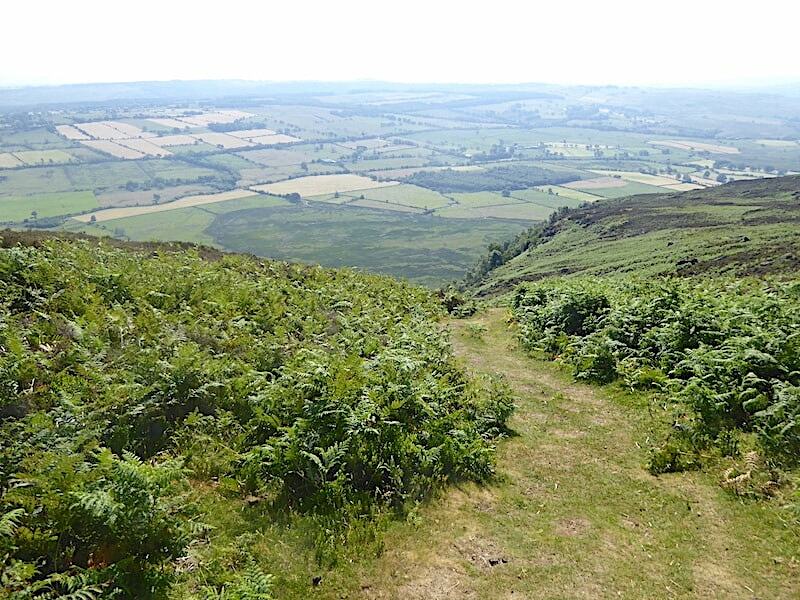 With the steep scrabble up Rake Trod and Further Gill Sike long forgotten, the sun beating down, the breeze ruffling our hair, and a firm dry path underfoot, this was moorland walking at its very best and we enjoyed every minute of it. 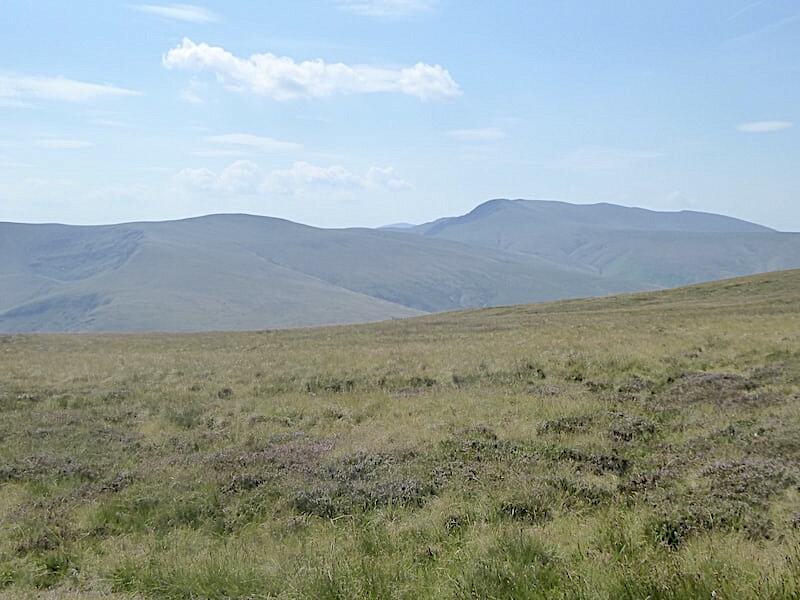 Bowscale Fell and Blencathra again as the ground begins to rise every so slightly towards High Pike. 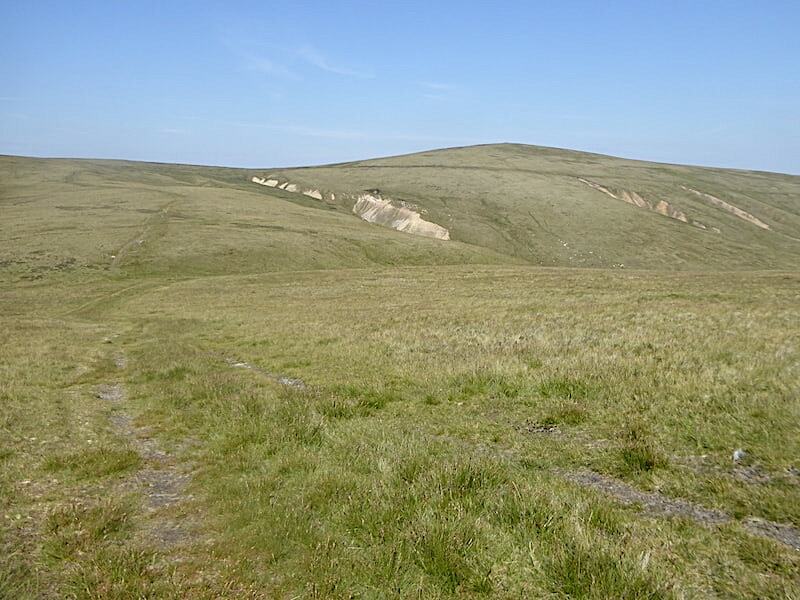 The rise is very gradual and the walking is easy as we approach Drygill Head. 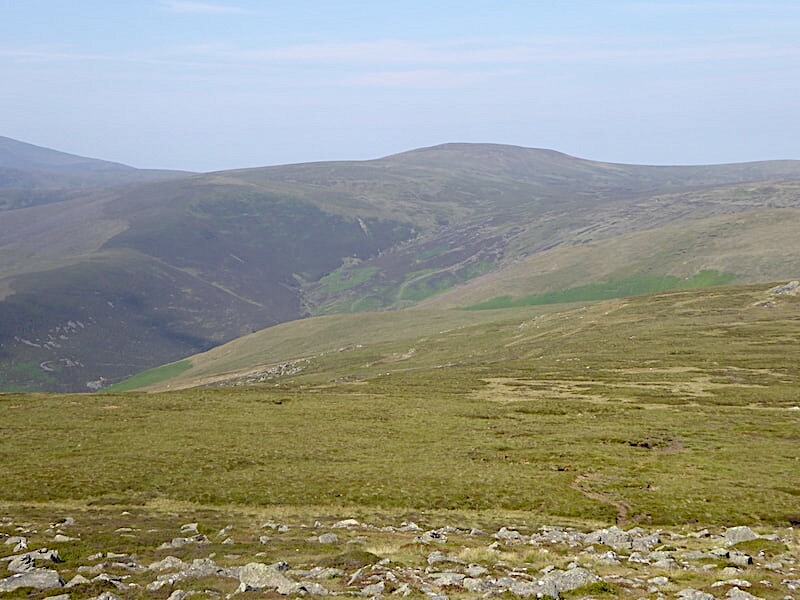 The view back to Carrock Fell from Dry Gill. I know nothing about mineralogy so what those wart like bumps are I have no idea. 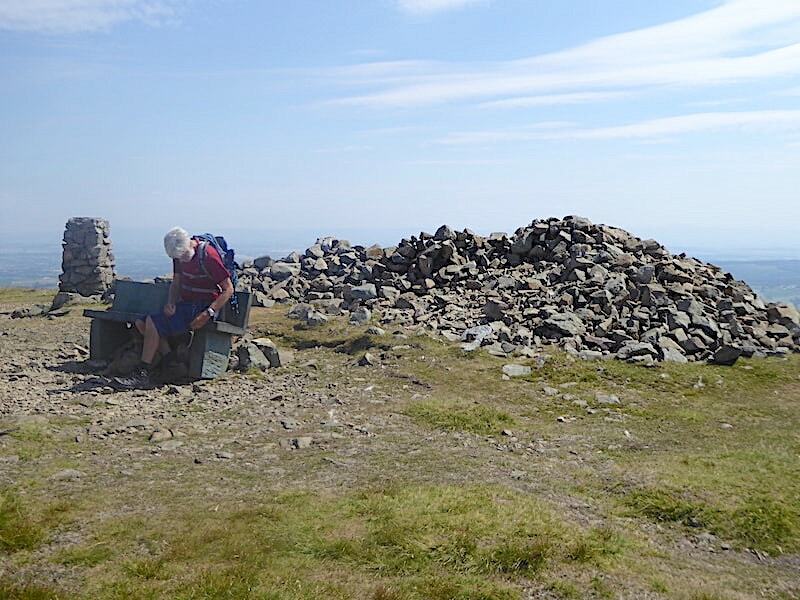 Fifty minutes after leaving Carrock Fell we arrive on High Pike summit with its trig column, cairn/wind shelter and memorial seat. 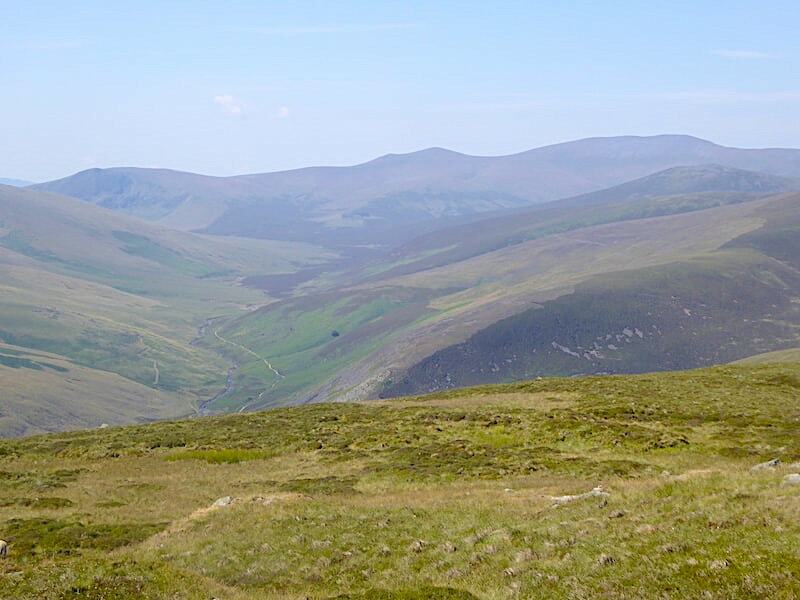 To the south west are Lonscale Fell and the Skiddaw range beyond the ridge leading up to Knott …..
….. and to the west are the Uldale Fells, another area of solitude and peace and quiet where you can often walk for miles and not see another soul. It really isn’t what might be called lunch time but its quite a while since we had breakfast so we made for the eastern side of the shelter for a sunny and breeze free raid on the sandwich boxes. We were slathered in flying beastie deterrent but that didn’t dissuade the bees (or wasps) who turned up all of a sudden, seemingly from nowhere, no doubt lured by the aromas emanating from our food boxes. We weren’t bothered too much by them and when we moved slightly to one side they left us alone altogether. Maybe they had a nest somewhere in the stones and they weren’t happy about us being too close to it. After our food stop we began making our way back passing the other sturdy wind shelter just a little lower down to the north from the summit. 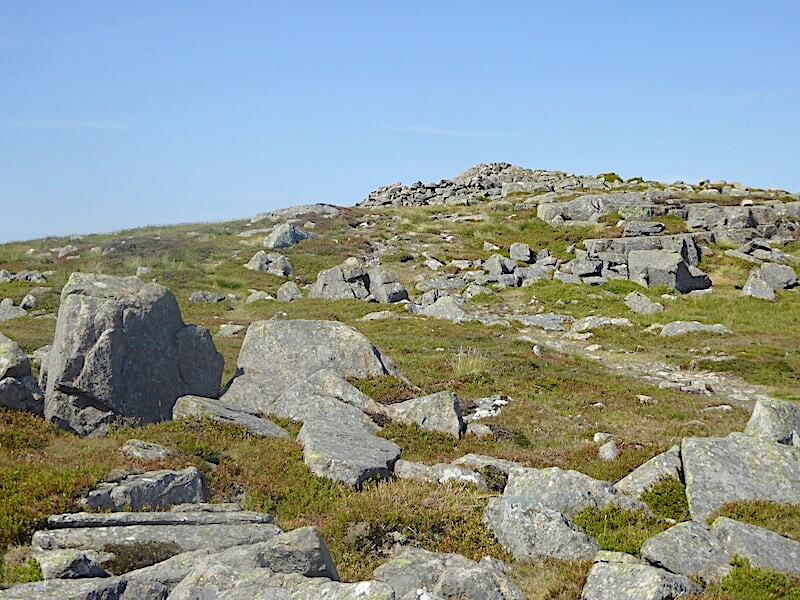 Apparently it is constructed from some of the stones which once formed part of a shepherd’s bothy. 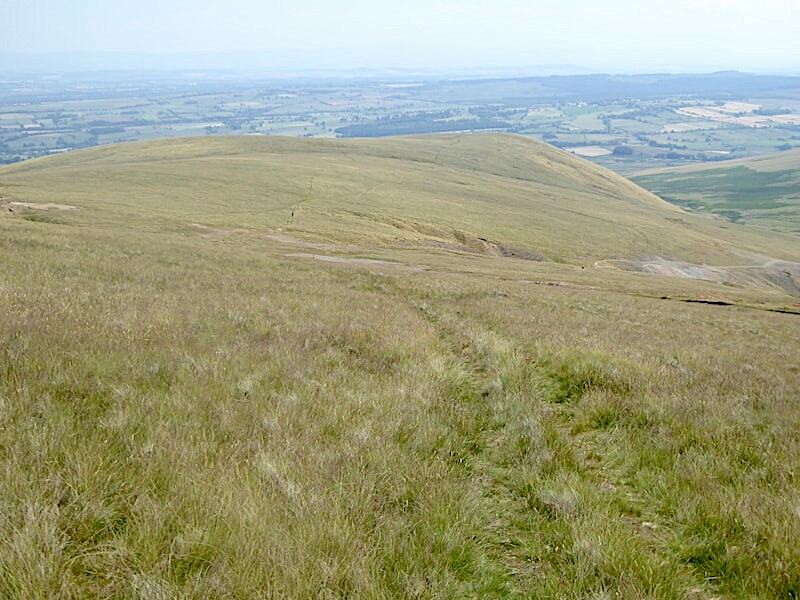 More enjoyable walking as we drop down and head over to West Fell. 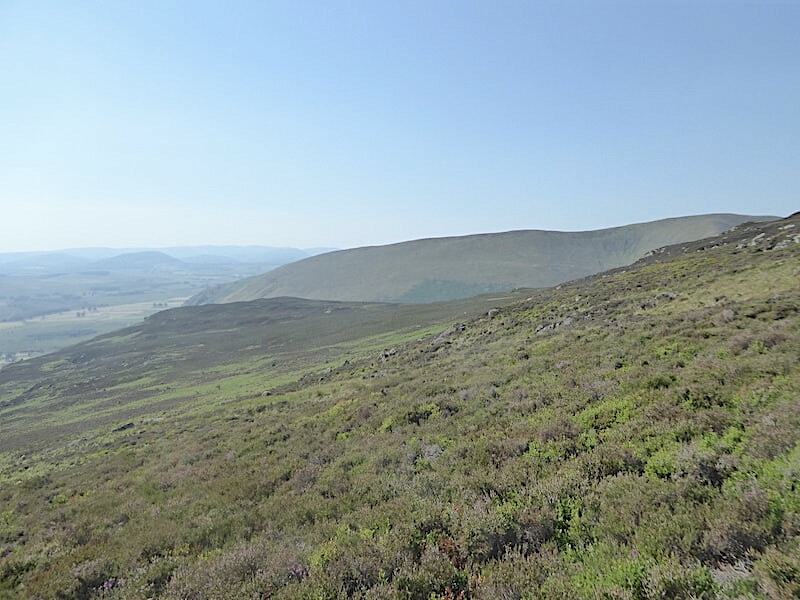 You might just be able to spot the lead figure of the trio of elderly gents, appearing as a black speck on the path, who were sweating their way up. Its almost midday and now its as hot a hell’s kitchen despite the breeze. They looked very weary as we passed by them. 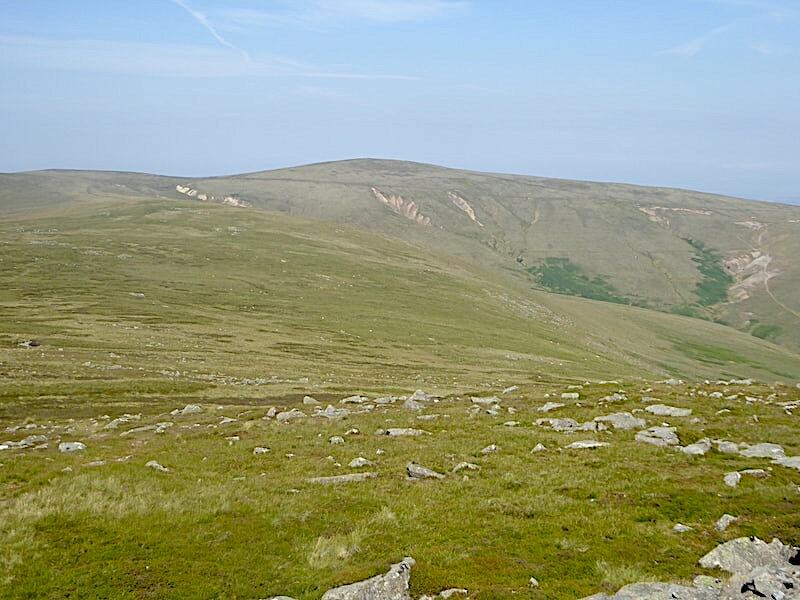 It seemed to take no time at all to reach West Fell from where I took a look back at the eastern slopes of High Pike, with Drygill Head and Dry Gill on the left, the deep scars of Red Covercloth down the centre, and Driggeth Beck on the right. 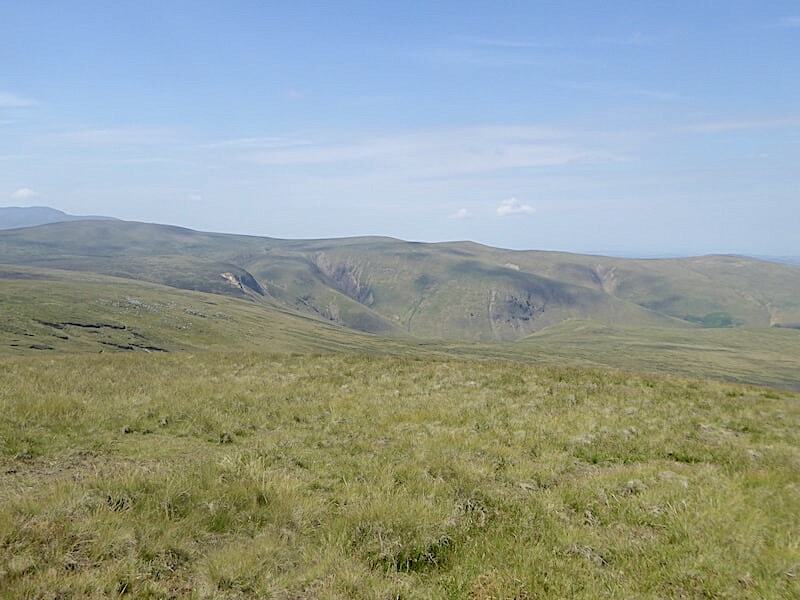 Dropping down from West Fell onto Sunny Bank, aptly named since it faces south and its grasses now bronzed and parches by the sun, unlike the slopes of Carrock Fell which face north and have retained their summer greenery despite the lack of rain. Crossing Carrock Beck posed no problems, its very narrow along here, the stream bed was full of dry exposed rocks and although water was flowing down there wasn’t much of it. 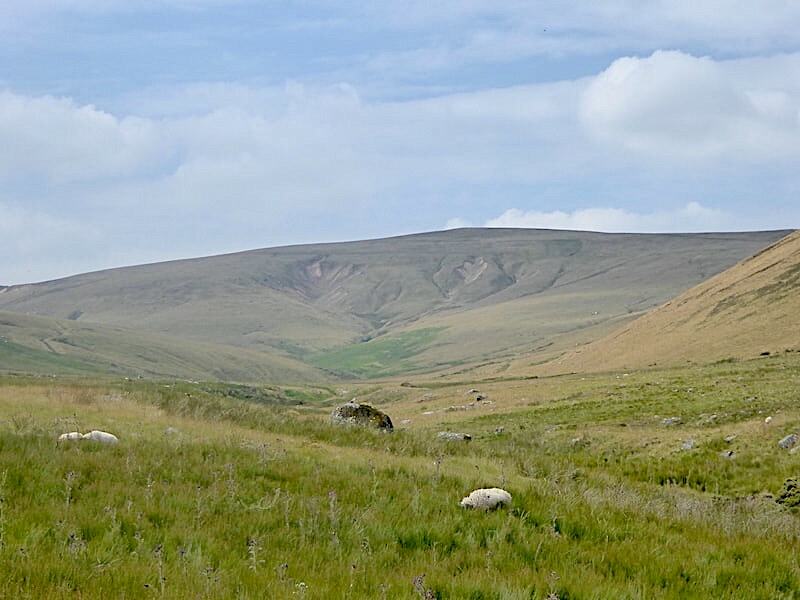 Once across the beck I took a look back at West Fell with its Sunny Bank …..
….. and then a last look back at High Pike and the deep scars of the Red Covercloth mining area. 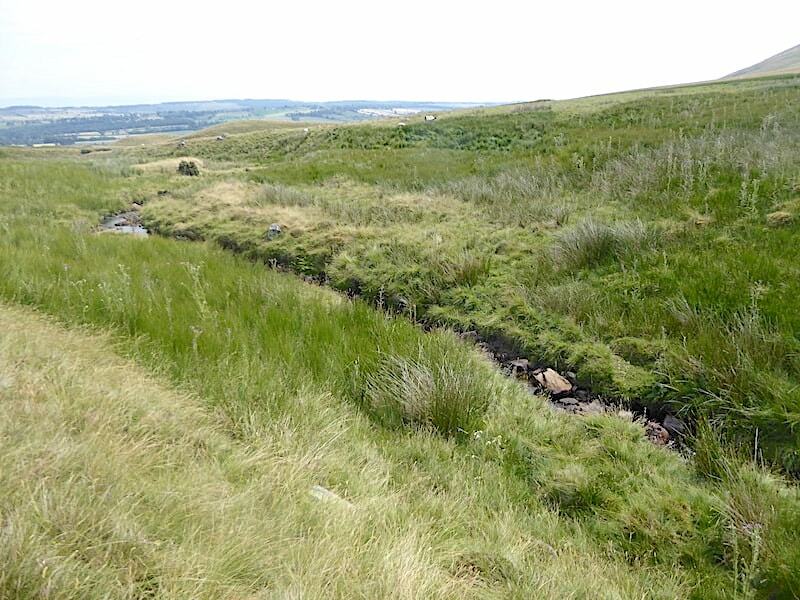 We followed the course of the beck for a few yards, mainly to avoid climbing over a number of small hillocks, and then cut across the grass to join the minor road through the Caldew Valley. 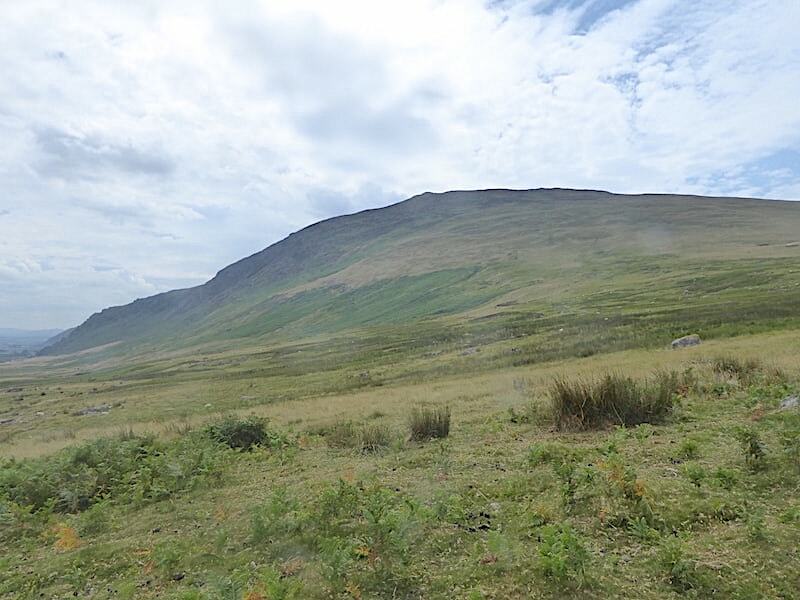 Almost back at the road now and a look across at Carrock Fell which will keep us company now all the way for the mile or so walk back to …..
….. the parking area near Stone Ends Farm where our car and two others are still parked. All the way down West Fell the cloud had been building steadily and by the time we reached the car the sun was completely hidden so it seemed that we’d had the best of the day’s weather. It didn’t make things any less warm in the valley though and simply walking back to the car in the muggy air had us both constantly reaching for the water bottles. After our holiday J reported weighing in with a couple or three extra pounds, the morning after this walk he was back to his normal weight. This morning’s close quarter combat with Rake Trod and Further Gill Sike might just be the reason.